The ghost of Spuds MacKenzie and an ad about immigration steal the show in the swell of upcoming Super Bowl ads. Advertisers are paying, on average, $5 million for 30-second spots during Sunday's game on Fox. But if you want to watch something other than commercials, the New England Patriots happen to be playing the Atlanta Falcons. 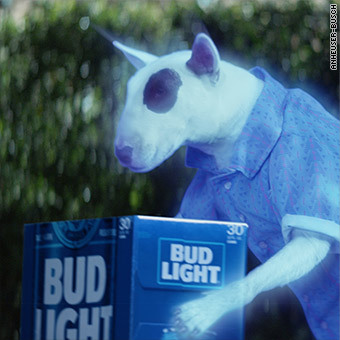 The ghost of Anheuser-Busch (BUD) icon Spuds MacKenzie returns in this ad for the Super Bowl. The basic message from this bull terrier apparition is that it's lame to sit around the house alone when you could be drinking Bud Light with your friends.